In the wake of yesterday's report on the detection of avian H7N7 in wild bird feces - and being only days away from Korea's three day fall harvest festival Chuseok (this year, October 4th-6th) - the government is visibly stepping up their avian flu control and containment program. South Korea will step up quarantine measures against bird flu ahead of the long holiday as a suspected case was reported in the country's southern region, the Ministry of Agriculture, Food and Rural Affairs said Wednesday. The ministry said an H7N7 strain of avian influenza was found in wild bird droppings that were collected in Yeongcheon, 344 kilometers southeast of Seoul on Sept. 13. Following its discovery, health authorities issued a warning that banned local poultry farms from entering the wintering grounds of migratory birds and ordered the disinfection of farms adjacent to the site. The ministry said it will implement strengthened quarantine measures in the coming weeks, as many people are expected to take trips around the country during the Chuseok holiday, which runs from Sept. 30 to Oct. 9. The National Institute of Environmental Research will further look into the dropping sample to figure out whether it is a highly pathogenic virus strain or a milder version. The results will be announced Sept. 27, the ministry said. Since January 2014, the South Korean poultry industry has been hammered by hundreds of HPAI H5N8 and - starting in 2016 - HPAI H5N6 outbreaks, which have resulted in the loss of tens of millions of birds. As we discussed a few weeks ago in South Korea To Move To Year-Round AI Prevention - while we still see the majority of bird flu activity during the cooler months of the year - the expected summer lull across many temperate regions has become less pronounced. As an example, in June of this year - after several months of little or no activity - we saw a fresh surge of activity and South Korea: MAFRA Confirms HPAI H5N8, Raises Alert Level To Maximum. In Europe, H5N8 sporadic H5N8 activity has continued throughout the summer, with Italy being particularly hard hit. 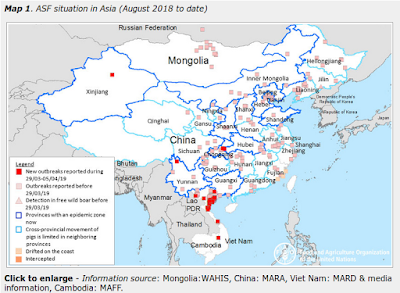 This year yet another emerging avian flu virus - HPAI H7N9 - has China's neighbors on edge, with its rapid spread out of Guangdong Province last spring (see China's Nervous Neighbors). As with HPAI H5, HPAI H7 virus appears to be traveling via migratory birds. After three consecutive years of heavy bird flu loses, a multi-hospital MERS epidemic in the summer of 2015, a fipronil contaminated egg scandal last month - and with the 2018 Winter Olympics Games to be held in Pyeongchang County next February - the South Korean Government is understandably keen to shut down any new crisis before it can get out of hand. In recent years South Korea has become a harbinger of sorts, often reporting their first bird flu outbreaks (or detections in wild birds or the environment) several weeks before other countries along the East Asian Flyway. All of which means we'll be keeping a very close eye on South Korea in the weeks to come.